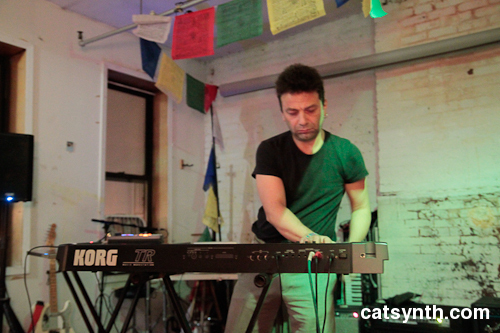 Today we look back at the first of my two performances in New York, the appropriately named “AvantElectroExpectroExtravaganza” with a diverse collection of experimental electronic musicians. It was a small an intimate space nestled in a building in an industrial section of Brooklyn, east of Williamsburg. But we had a decently large stage and good sound reinforcement, and a small but attentive audience. And the industrial setting was one conducive to both my playing and enjoyment of art and music. The performance began with a procession by members of the SK Orchestra improvising to sampled phrases “Hi” and “How are you doing”. For those who are not familiar with the Casia SK-1, it was a small sampling keyboard from the mid 1980s which allowed users to record and manipulate live sounds in addition to standard consumer keyboard features. The low fidelity and ease of use now makes them coveted items for many experimental electronic musicians. There were no fewer than five of them in the ensemble this evening. As they sat down for the main part of the set, the sampled sounds grew more fragmented and processed, mixed with lots of dynamic swells and analog-filter-like sounds. Combined with a wide array of effects, the sounds were quick thick ranging from harmonic pads to noise to moments that could be best described as “space jam music.” I was particularly watching articulation with a Morley pedal and how it timbrally and rhythmically informed the sound. Taking advantage of the live-sampling capabilities of the SK-1, they resampled the output from the amps and PA and fed that back into the performance for a slow motion feedback loop that grew ever noisier and more forceful. The rhythms got more steady over time, with a driving beat set against the phrase “Holy Jesus!”, and eventually moved into a steady bass rhythm and pattern. Rhythm was the main theme of the next set featuring Loop B. 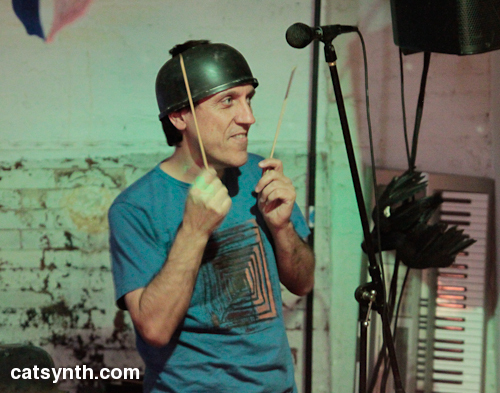 His theatrical and technically adept performance featured tight rhythmic patterns on found metal objects with playful choreography and beat-based electronic accompaniment. In the first piece, he performed on a large piece of metal salvaged from a vehicle with syncopated rhythms set against an electronic track. This was followed by a piece in which he donned a metal helmet, which he played against more Latin accompaniment. Other metal instruments included a wearable tube, as featured in this video clip. And a return to the original car metal, but with a power drill. The rhythmic character of the different pieces seemed to alternate between driving electronica and Latin elements, but this was secondary to the spectacle of the live playing. It was a unique and well-executed performance, and fun to witness. It would be interesting to hear what he could do in an ensemble setting with musicians with an equally tight sense of rhythm. 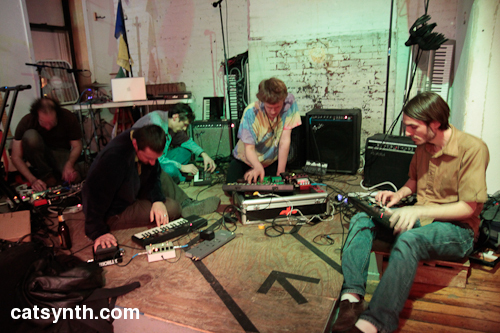 Loop B’s energetic and dynamic performance was followed by a very contrasting set by Badmitten (aka Damien Olsen). It began with eerie, ambient sounds that soon coalesced around watery elements. It gave me the sense of sitting near an alien sea shore. Pitch-bent tones were layered on top of this, and eventually noises and glitches that deliberately interrupted the ambience. A low-frequeny rhythm emerged along with a slow bass line. It seemed that music was moving from the sea to a forest. The sounds were quite full and luscious, with guitar chords and synth pads. Over time it became darker, with modulated filter sounds and strong hits. Seemingly out of nowhere, a voice speaking in French emerged (which amused French speakers in the audience). The various sounds coalesced into a more steady monotone rhythm with minor harmonies, which started to come apart and become more chaotic. The set concluded with an electric piano solo. It was then time to take the stage. Fortunately, we had quite a bit of time and space to set up before the show, so most everything was in place and I was able to get underway quickly after checking that the local wi-fi network between the iPad and the MacBook Pro (running Open Sound World) was working. I opened with a new version of the piece Spin Cycle / Control Freak that used the iPad in lieu of the Wacom Tablet from the original version 11 years prior. It worked quite well considering the limitations of the interface – and indeed the more rhythmic elements were easier to do in this case. This was then followed by a stereo version of the piece I composed for eight-channel surround and the dodecahedron speaker at CNMAT back in March. The timbres and expression still worked well, but I think it loses something without the advanced sound spatialization. I concluded with a performance of Charmer:Firmament from my 2005 CD Aquatic. The final set of the evening was Doom Trumpet, which did not feature a trumpet. 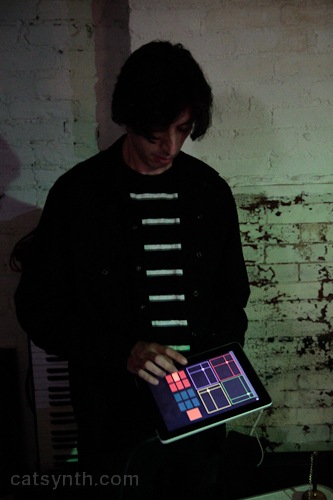 Rather, artist David Smith performed improvised music with guitar and effects set against a video compiled from obscure science-fiction movies. I found myself focused on the visuals, and particularly liked how he opened many of the clips with a highly-processed version of the MGM lion. Musically, he layered samples and loops with live guitar performance through a variety of effects. 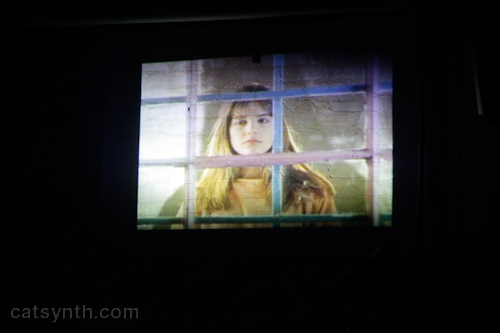 The combination of the music and visuals (which seemed to be dated from the late 1960s through early 1980s based on costumes and hairstyles) kept things appropriately dislocated from the source material and more abstract. Overall, it was a great night of music, which I was glad to be a part of. A few participants will be part of my next New York show at TheatreLab this coming Saturday, but I certainly hope to cross paths with everyone at concerts in the future. Michael is a member of the SK Orchestra, which I had the opportunity to hear and review in New York last November. On Saturday, I went a couple of very different performances in various neighborhoods of Brooklyn, ranging from poetry reading and performance art to experimental jazz and pop. At Central Booking in the DUMBO section of Brooklyn, I saw a performance by the Sk Orchestra, which uses Casio SK-1 sampling keyboards as their main instrument. The SK-1 is a very playable instrument for low-fi real-time sampling and lends itself well to live performance. On this evening, the orchestra was more of “chamber ensemble”, with two SK-1 performers plus a third performer playing an old-style hand-cranked telephone. The SK-1s were used for live sampling in a “call-and-response” style, with one player sampling a phrase in his own voice, and the other providing a sampled response. The back-and-forth of samples at different rates of attack and pitches got increasingly confrontational as the performance went on, even approaching “fake violence” as the players hid behind a screen from which screaming sounds could be heard. The performance was actually part of a release party for the book Antibodies, a collaboration of the interdisciplinary artist and musician Brandstifter and the word-and-sound artist Dirk huelsTrunk. The art book was based on found text and images from German medical textbooks. The authors performed a live reading from the book, reading lines once in German, once in English and the sung in both languages simultaneously. The performances featured a wide variety of musical and theatrical styles, from popular to more subdued to noisy/avant garde. At the Music Hall of Williamsburg, I saw a show featuring the Toronto-based band Do Make Say Think. Their music combined rock and pop with jazz and experimental elements, moving seamlessly from a driving rock rhythm to a rhythmless section of extended delay lines and analog-synthesizer drones to an acoustic chorale of trumpets and saxophone. They were able to blend the timbres of the core instruments (guitar, bass, drums, keyboard) with the large horn section and their rather impressive array of electronics – each performer appeared to have a large collection of dedicated pedals. The overall show had a lot of energy and seemed to move forwarded from one song to another without stopping (hence the joke towards the end of the set that they were “now going to play their second song), and resonated with the full but not claustrophobic audience.